A light sprinkle of rain made it cool, damp and still — in contrast to the heat, dust and tension of the preceding months. Some of the passionate pleas to save the bushland handwritten on paper hearts and tied to the fences were lying on the ground. The struggle to stop the Roe 8–Perth Freight Link freeway project had gripped Perth's south-western suburbs for more than two years and defined the lives of many activists for even longer. The campaign was at fever pitch through 2015, only to quieten down in December after the Supreme Court ruled that the environmental approvals were invalid. It kicked off again late last year after the state government successfully appealed the court decision. With the new Labor government committed to cancelling the project it is time to reflect on what happened and what happens next. Perth is a sprawling car-dependant city; new freeways are uncritically heralded as progress. The spread of suburbia lines the pockets of the project home, civil construction and motoring industries. While there are profits to be made in alternative forms of urban development, those who have built their empires on the current model hold sway. Many still take at face value the mistaken idea that expanding road capacity can solve congestion and it remains the default position of state and federal governments. However, if there is one area in Perth where the freeway fundamentalists were likely to collide with community opposition then greater Fremantle was surely it. It is where support for investment in sustainable transport instead of freeways is strongest. This has many roots. Smashing a freeway through a reserve that is home to threatened species and multiple sites of historical and cultural significance to the Nyoongar people would never be accepted. 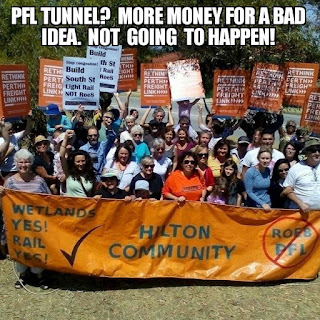 This portion of the Perth Freight Link (PFL) — Roe 8 — has been on the Liberal Party wishlist for decades, and with it active community opposition from the Save Beeliar Wetlands group. The unsuccessful struggle to stop the construction of Farrington Rd through the northern end of the wetlands in the 1980s galvanised a generation. The community would not let it happen again. In the 1980s the community and council rallied to get the Fremantle passenger rail service re-opened. It had been closed by the Charles Court Liberal government in 1980, which intended to use the land for a freeway. City of Fremantle councillor Peter Newman, who went on to become Professor of Sustainability at the Curtin University Sustainability Policy Institute, which was for a long time based in Fremantle, helped spread the word that investment in public transport can be a catalyst for a different urban form. The Fremantle Eastern Bypass, an earlier incarnation of PFL, was decisively defeated by a campaign run by the community groups Transport Action Coalition (TRAC) and Community Alliance for Responsible Transportation (CART). In 2001 the Geoff Gallop Labor government rezoned the land for housing and sold it, effectively killing off that freeway route. In 2011, Fremantle Road to Rail formed in response to state government claims that Fremantle's High Street needed to be "upgraded" from four to six lanes to accommodate truck traffic to Fremantle Port. The group highlighted the various cost-effective measures that would enable a far greater proportion of freight to go by rail. The current truck-dependant freight distribution system is no more natural or necessary than cars are for moving people. Additionally the Cities of Cockburn and Fremantle have consistently opposed Roe 8–PFL. Fremantle's emphasis on the need for transformational public transport projects to revive its flagging commercial centre, and its more than ten-fold increase in expenditure on bicycle infrastructure, have helped cement the understanding that freeways are yesterday's technology. The decision by the Greens in early 2015 to throw their effort into the struggle against the freeway and resource the formation of the Rethink the Link group lifted the campaign up to a new level. Together with Save Beeliar Wetlands and Road to Rail, these groups formed the Rethink Perth Freight Link Alliance which in turn drew in 35 community groups and five local governments, as well as Labor, the Greens and Socialist Alliance. The campaign signalled its intention to fight the freeway every step of the way when it asked residents to "take the pledge" and join an emergency SMS list. Prominent figures in the campaign were photographed signing up, some symbolically chained to a fence. Thousands signed the pledge which reads: "I pledge that I, along with other community members, will engage in peaceful but determined protest activity in opposition to this unpopular, costly and environmentally devastating freeway. Instead of freeways, governments should be investing in improved and expanded public transport, rail freight and other sustainable and economic freight solutions." Not to be outflanked by the Greens or Socialist Alliance, local Labor MPs took out multiple full-page ads in the local press in mid-2015 slamming the project and committing a Labor government to scrap it. At a community meeting in the suburb of Hilton — one of dozens of community meetings held at that time — a Labor MP told the crowd to prepare for non-violent direct action. The momentum of the campaign felt unstoppable, not least when 10,000 people joined the Rethink Perth Freight Link contingent at the annual Fremantle Festival Parade. We scarcely believed there would be still be a final tumultuous chapter, during which we would send out urgent SMS appeals for people to come down and link arms at 5am. Ironically it was then-Prime Minister Tony Abbott who helped forge the campaign's breadth. Barnett wanted to build the freeway piece by piece, but Abbott insisted on announcing it, naming it and starting construction straight away. His crash or crash-through approach united every strand of opposition. The fact that it had not been designed or costed necessarily brought with it a stream of lies, secrecy, glaring contradictions and open warfare within the Liberal Party. It is not an exaggeration to say that the Liberal Party were smashed in the public debate. To the very end they refused to perform a coherent cost-benefit ratio analysis for PFL and the election eve revelation that the Stage 2 tunnel under Fremantle would cost $5.8 billion and not the $1.2 billion they insisted on telling the press, summarised the debacle. The state and federal government approach to transport planning was exposed as a frantic attempt to transfer as much public money into the hands of civil construction as they possibly could. In this case the beneficiary of the largesse was to be Liberal Party donor CIMIC Group (formerly Leighton Holdings), the very company that had proposed the PFL to Abbott in the first place. Can the new Labor government be counted on to scrap the freeway as promised? They have and they will. I believe the campaign reaches far too deep into their ranks to do otherwise. The new challenge will be to ensure there is the investment in sustainable transport alternatives for people and freight we need, because only this can kill off the freeway scourge for good. The creative outpouring of people power that stopped Perth Freight Link will need to be mobilised again to create that alternative.